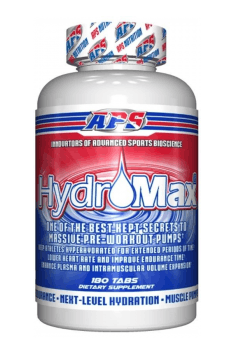 APS HydroMax is an extraordinary dietary supplement containing up to 65% of easily digestible glycerin powder. It is a hygroscopic substance, which improves the ability to retain water in the body. The preparation promotes the building of muscle mass, supports the transport of anabolic substances and allows achieving a powerful muscle pump. The product is a perfect pre-workout supplement, which prepares the body for increased physical effort. Glycerin (glycerol) is polyhydroxy alcohol containing three hydroxyl groups. In nature, it is mainly found in animal and vegetable fats. It is used not only in supplement industry but also in in the production of soaps and cosmetics. It has hydrophilic and hygroscopic properties – this means that it eagerly absorbs water. Due to these features, glycerol is a very desirable diet supplement among gym enthusiasts. Glycerin by retaining water in the muscles makes them more swollen and better supplied with blood. This improves primarily the intramuscular transport of nutrients and gives a positive visual effect (vascularisation). The greater amount of water causes the increase of the musculature volume, making it look more attractive, thus motivating for further work. People supplementing glycerin observe greater muscle pump compared to people who do not use glycerol. This product increases vascularity and increases blood flow through the muscles – it will perfectly complement the action of e.g., arginine. Along with the improved hydration of muscles, the efficiency of synthesis and growth processes increase, too, because greater water potential promotes anabolic reactions. The improved blood supply to the muscles also causes deeper and more efficient penetration of nutrients and oxygen into the muscle cells, which increases their efficiency and regeneration. As a result, we can observe faster effects and better performance, due to the ability to perform heavier training sessions. This effect, however, is noticeable after providing adequate fluid supply, which leads to their binding by glycerol. Glycerin can also be an additional source of energy and may accelerate fat burning. Entering the gluconeogenesis pathway, it becomes a substrate for glucose synthesis. This happens when the demand for energy or the amount of calories consumed is insufficient. The body then sends information about the need to provide more food. Glycerol reacts to this signal and transforms into glucose, which provides the required energy without consuming an additional portion of food. The above-described mechanism may to a certain extent prevent the deposition of fat in the subcutaneous tissue. As can be seen, glycerin promotes body recomposition – muscle growth and fat loss. Retention of more water in the tissues by glycerin brings additional benefits. The more hydrated tissues result not only in more water in the cells but also an increase in the volume of the transcellular fluid, which includes, among others, the fluid in the joint cavity. Thanks to this, the risk of contusion and injuries of joints as well as cartilages they contain are reduced. This effect can be particularly helpful for physically active people who constantly burden their movement system. In summary, APS HydroMax is a pre-workout preparation that supplies large amounts of glycerol. It contributes to the creation of a muscle pump and the increase of their efficiency through better blood supply and saturation with nutrients. The product is free of stimulants, which is why it will certainly appeal to people who tolerate them badly. Take 1 serving 1-2 times daily with 8-16 oz of water or other favorite beverage. Take 30-45 minutes prior to workout. To make the most of the potential of this product, drink large amounts of water during supplementation. Too little fluid supply may cause constipation or increase blood pressure. If these symptoms or diarrhea occur, the dose should be reduced. People with diabetes should not take glycerin due to the increase in glycaemia. APS supplements and nutrients are designed for athletes. Among their products, there are multi-component supplements, which improve the muscle work, increase the strength and endurance, at the same time they add energy, enhance the regeneration, increase anabolism and slow down the catabolism. APS offers also products, which helps to reduce excessive fatty tissue and creatine supplements, which speed up the development of muscle tissue. Microcrystalline cellulose, carboxymethyl cellulose, titanium dioxide. As many as 7 active components with anti-inflammatory action, diminishing pain, joint cartilage degeneration.